Now what’s this? 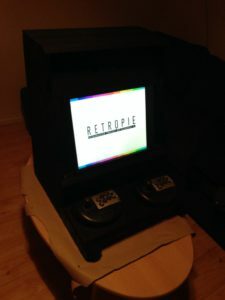 An arcade machine? 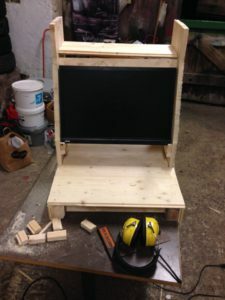 A tabletop standup cabinet arcade machine – a gaming device – built from components I’ve scraped together. 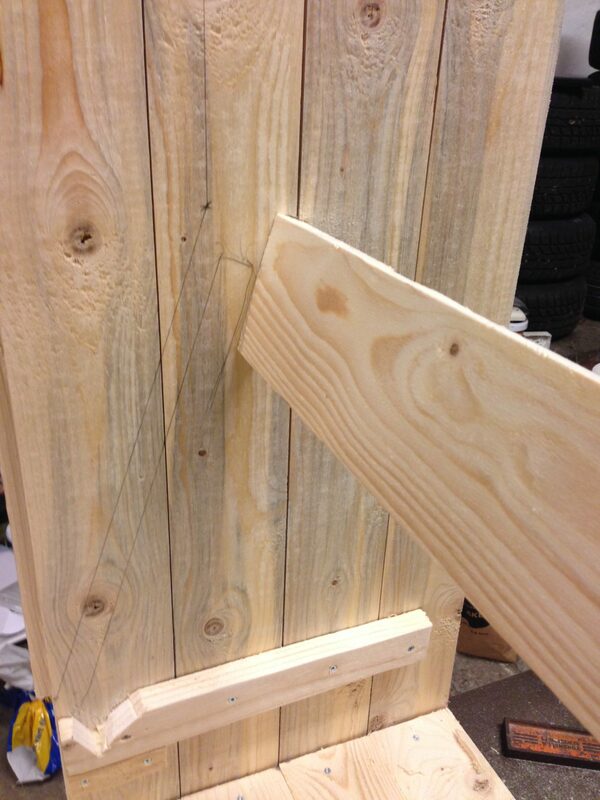 More of a prototype than a finished product, but fully usable. And fun! Why would you build something like this? Arcade games are cool, aren’t they? I’ve always imagined having a proper cabinet at home, and thanks to the advent of technology I can finally make one myself! This was built only using things I already had at home, since I wanted it to be a low cost project and it was mostly intended as a fun prototype to see what I could do. 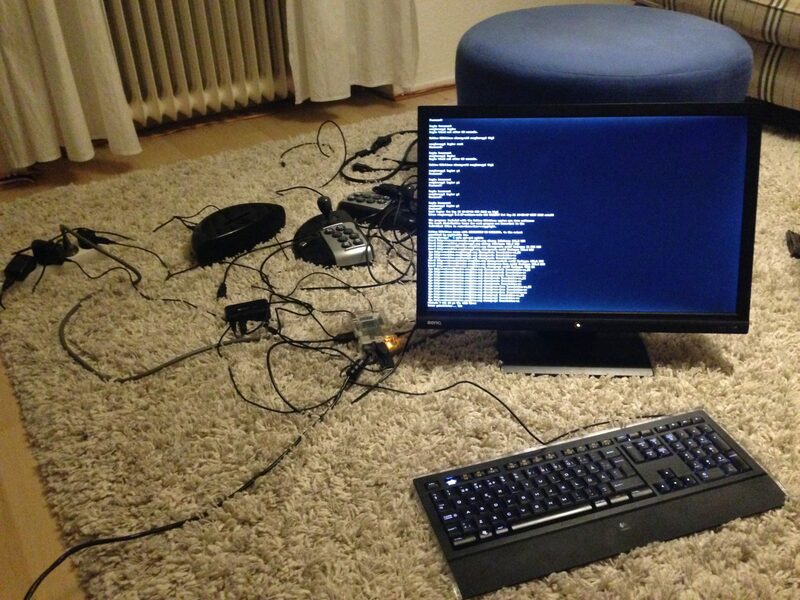 At the first iteration of the tretton37 hosted Leetspeak conference all attendees received a Raspberri Pi version 1. I tested it in various ways, as a server, NAS and other things, but eventually it just sat there in a cabinet looking sad. Being a low powered device with great capabilities, and easy enough to use, it soon became apparent that it would be the ideal choice for an old-school gaming rig! I had an old 22 inch LCD lying around since I mostly use laptops these days. After a few quick yanks, twists and screws the frame and support were removed, which made the monitor considerably smaller. Thus it could fit into a reasonably sized cabinet. The RPi is USB powered, so an old android charger did the trick here (make sure your charger provides enough power though, at least 1A, to power accessories). Add a power strip for the monitor and charger and the only thing sticking out of the box is a power cable. Not strictly necessary, but very good for testing and development. I had a Logitech Illuminated keyboard with a few keys missing, and I keep it hidden inside the cabinet. A must for playing games! These were also a factor in deciding the size of the cabinet, since I wanted them fixed to the base and not moving around. Two Playstation 2 arcade sticks and a PS2-USB adapter worked like magic. Back before bluetooth speakers were popular I bought a few wired portable speakers, and plugging one in to the RPi was easy enough. Since the speaker has a volume control and can be both battery powered and connected to a power outlet it was ideal for this use. Hifi audio was not a requirement here, nor subwoofer bass. An excellent starting point for any RPi project, built on the solid and well tested foundation of Debian linux: Raspbian. RetroPie is a beautiful thing! Not only can you get images with everything you need pre-installed – it also serves up an excellent front/launcher so you can choose games with only a joystick. It acts as a container/wrapper/front for MaME and a lot of other systems. For a long time now MAME has been one of the few must-have emulators on the market. It can handle so many systems, and handles them so well, that this might be all you need. Now this was slightly more problematic. While RetroPie does come with some gaming software, it is very limited in that regard. Most rom files – even for older systems such as the NES – are still protected by strict copyright laws. Part of the reason for this is that the copyright owners now sell digital versions of their games under various “arcade” or “live” formats, or in multi-game packages. So, how to obtain free and licensed games that are still interesting? If you have licensed software you can use, you can skip this step. The MAMEDev website has a few legally distributed roms you can start with. Sega classic packages contain rom files which should technically be legal since you bought a copy of them. The same goes for Neo Geo classics. DOS games can also work, some are available from Blizzard, others on GOG.com. Also there is a bunch of “abandonware” on the internet – but be sure to check that you actually obtain a legal copy. Finally the Atari Vault contains rom files that can be extracted as well. This part of the project was easier than I initially thought it would be. I started by gathering up some spare parts left over when renovating around the house, pieces of wood, screws and such. Then came the process of designing the thing. I drew a few lines on paper with the general shape I imagined, and the size of the monitor forced the measurements horizontally. I wanted to fit the speaker on top, and have a resting place for a keyboard or joysticks, and after a few quick measurements of the components I knew how big it needed to be. After this the actual building was all that remained. I built the box and fixated the monitor with smaller pieces of wood. The speaker needed holes for the audio to come through, so I drilled some holes. The front looked weird so I beveled it a bit. Finally I applied some black paint – using a spray painting tool made this a breeze, and the whole construction was done in just two quick evenings. This hacked together arcade machine was a fun project, and not terribly difficult. Decidedly not very expensive either, since the only thing I had to buy specifically for this project was a small can of black paint. I’ve played a few games on it since it was completed in 2014/2015 and a bunch of my friends have had fun with it too. Once I’ve upgraded the RPi in it I’ll see if the kids enjoy it as well. The first thing I’ll do is install a newer version of RPi, probably version 3 model B, to be able to play more modern games. 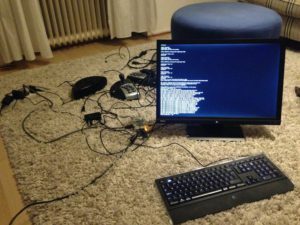 A possible future development, maybe in a new cabinet, would be to extract parts from a proper PC computer and attach them inside the box to make a real multi media entertainment device. This could be made to play Steam games or most anything you can think of, though I appreciate the lack of mechanical moving parts and low power consumption of the current setup. And why not dream big? Put some solar panels on the back and/or top and a battery inside, maybe a car battery, and a voltage regulator. Endless hours of portable fun! This would probably be easier to realise in a lighter box with a smaller screen.